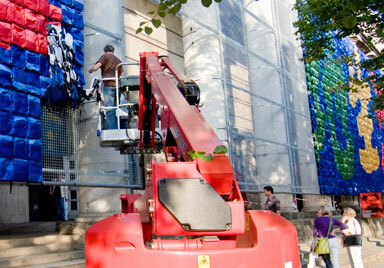 after more than two weeks of great effort and labour, the monumental installation titled “remembering” on the front side of the museum is now almost finished. this work of art consists of about 9,000 colorful backpacks of the same kind as those that are carried by chinese schoolchildren. the vivid colors remind us of cheap plastic toys that nowadays are almost always manufactured in the people’s republic of china. remembering has a deeper and much more disturbing message, though, and must be considered as central in the work of ai weiwei. in 2008, an earthquake shook the ground in the remote province of sichuan in south china. while many buildings were damaged only lightly, it were schools that collapsed in the course of this disaster because they had been built neglecting the building code due to corrupt officials that cared more for their personal livelihood than for the lives of the children that went to study in these buildings every day. when the earthquake hit the sichuan schools, thousands of children died, buried under the debris of the collapsed structures. in the aftermath, officials tried to hush up this obvious scandal so it was up to brave political activists to research the incident – among them Ai Weiwei. The artist went on numerous journeys to sichuan, talking to the parents of the children that had become victims of greed and corruption just as much as of the devastating force of nature. when ai tried to appear as a witness in the corruption lawsuit, he was disallowed to do so from the beginning – so he travelled to sichuan for one last time in order to be able to follow the case as an observer, at least. 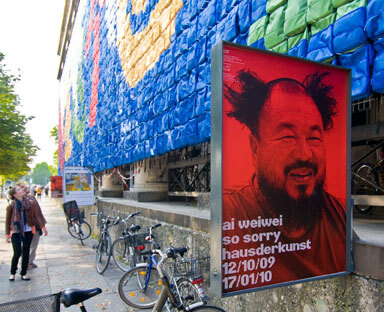 it was then, in the past august of 2009, when members of the chinese secret police faced ai in his sichuan hotel room, arrested the artist, held him captive for about 18 hours and beat him up so badly that he had to undergo emergency surgery five weeks later, just after having arrived in munich to prepare the upcoming exhibition. according to the neurologists of the university hospital in munich, ai had had a life-threatening intracranial haematoma that might have killed him if he had come to the hospital much later. now, ai has announced that he is going to accuse his country’s government for the violence that has been exerted on him. although these events are certainly alarming, they have also resulted in quite a lot of media attention for the exhibition and the reception of ai’s work in germany, so hopefully this time, officials won’t be able to put ai weiwei off with a lapidar “so sorry”.